Play flash movies, control playback and generate thumbnails. 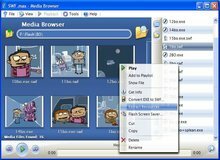 SWF.max Flash Tools includes advanced flash player with playlists and full-screen support. – automate tasks using command line and scripting.